It is great for sore and tired muscles and helps relax nerves. It is valuable for treating the symptoms of stress, such as fatigue and anxiety, and it also uplifts and invigorates the spirit. It is fabulous for your skin......it has been called Mother Nature's moisturiser..... and I love the gorgeous smell. Palmarosa is an aromatic grass found growing wild throughout India, and has been used for medicinal purposes for thousands of years there. 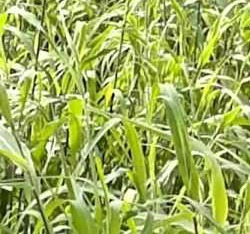 In Ayurvedic medicine it is known as ‘Rohisha’ and the grass is often used as a poultice to help relieve ailments such as rheumatism, sciatica and lumbago. Steam distillation of the dried grass. Antidepressant, antiseptic, antiviral, bactericide, cicatrisant, cytophylactic, digestive, febrifuge, hydrating and stimulating. Palmarosa essential oil has calming yet uplifting properties so is good for treating stress-related problems, anxiety and nervous exhaustion. It promotes and accelerates the healing of cuts and wounds. Helps treat digestive disorders and intestinal problems. Very useful for cooling fevers, either viral or bacterial. Palmarosa is also an insecticide and is very good as an insect repellant. This is an excellent choice of essential oil to use in skincare, as it has wonderfully beneficial qualities for all skin types. It is very moisturising and hydrating and promotes the growth of healthy skin cells. It is often used to help heal cracked, chapped and broken skin. Great for sensitive and/or irritated skin as well as eczema and psoriasis - it helps fight bacteria and infection and promotes cell regeneration. Wonderful for tired feet and athlete's foot. Helps relieve rosacea and helps reduce wrinkles. This oil is considered completely safe, since it is a non-irritant, non-sensitizing and non-toxic substance. Add 2 to 3 drops to your diffuser or burner to help you feel positive , content and secure. For skin conditions and disorders such as acne, eczema, and fungal infections, mix 2-3 drops in 25ml of carrier oil. Gently swab the affected area using a cotton wool ball or lint free material. Tired or aching feet? Put a few drops in a bowl of warm water with some epsom salts and give your feet a good old soak! Because Palmarosa oil is so good for the digestive system and anti-bacterial, it has long been added to Indian curries and African meat dishes to kill the bacteria and aid digestion. Historically, palmarosa was used as a substitute for the very expensive rose oil....unfortunately it has also been used by unscrupulous beings to adulterate rose oil.